“Oyster work” in woodworking is a veneering technique where a limb of a tree with heartwood-sapwood contrast is sawn into cross-sectional pieces. If the limb is cut perpendicular to the growth the pieces will be roughly circular. If the limb is cut at an angle the pattern of the grain is elongated into an ellipse. These parts can be pieced together in any number of interesting patterns. 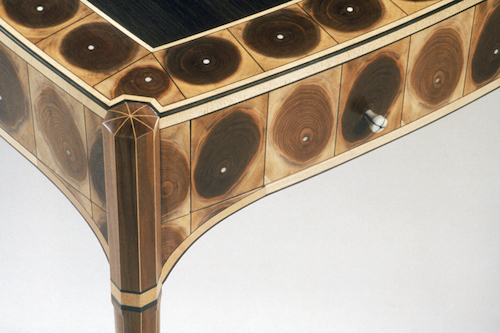 The technique was often used on Dutch and English furniture (see earlier post). In 1990 a hurricane came through New England and knocked down many trees in our area. Someone contacted me to say they had lost a walnut tree and wondered if I could use the wood. I wasn’t able to deal with the trunk, but I did collect a number of limbs. Walnut is an excellent wood for oysters. The endgrain of the heartwood is a beautiful dark brown and the sapwood has a creamy color. 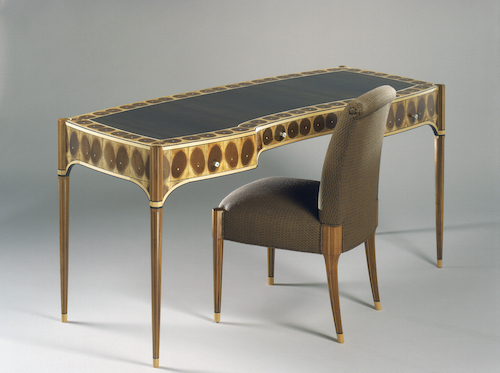 For this writing desk I cut a set of oysters in circles and a set at about 35 degrees. They were all from the same limb so the diameter of the heartwood was pretty much the same. The circles bordered the top and the ellipses were the apron. My intent was to have it look as if there were solid wood blocks running around the whole desk.